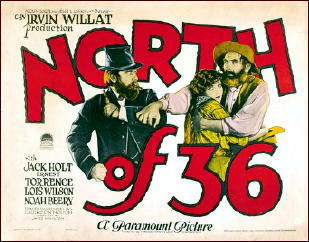 » A Western Movie Review by Walter Albert: NORTH OF 36 (1924). 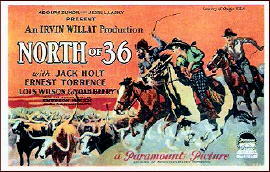 A Western Movie Review by Walter Albert: NORTH OF 36 (1924). NORTH OF 36. Paramount Pictures, 1924. Jack Holt, Ernest Torrance, Lois Wilson, Noah Beery, David Dunbar, Stephen Carr. Based on the novel by Emerson Hough. Director: Irvin Willat. Shown at Cinevent 35, Columbus OH, May 2003. Lois Wilson plays Taisie Lockheart, a Texas rancher who needs to get her herd of cattle to Abilene and across “a thousand miles of Indian territory.” Noah Berry, the villainous Texas State Treasurer (some things never change, I guess) Sim Rudabaugh, scheming to take control of her land by any means necessary, tracks the cattle drive with a crew of ruffians among whom is good guy Jack Holt aiming to thwart Rudabaugh’s plan. This was conceived as a sequel to The Covered Wagon and was to be directed by James Cruze, but a cut in the budget lost the company the director and its grandiose plans for another epic of the West. However, they were able to engage the last remaining herd of longhorn cattle for the drive and the excitement of the drive and the work of an excellent cast more than makes up for any budget deficiencies. The punishment meted out to Rudabaugh by the Indians he’s wronged is a truly horrific moment in film vengeance, and the audience responded with cheers and applause. They don’t make ’em like this anymore. And they should. Would like to have seen this. I just got a copy of the original novel by Emerson Hough, with stills from the movie, and will eventually get around to reading and reviewing it. Thanks. Emerson Hough, as a very early western writer, is an author I don’t know very much about. Hopefully I’ll spot your review of his book when you get it posted, Ron. I’d be interested in knowing what you have to say about it.